In the South, football is no joke, and neither is our food. 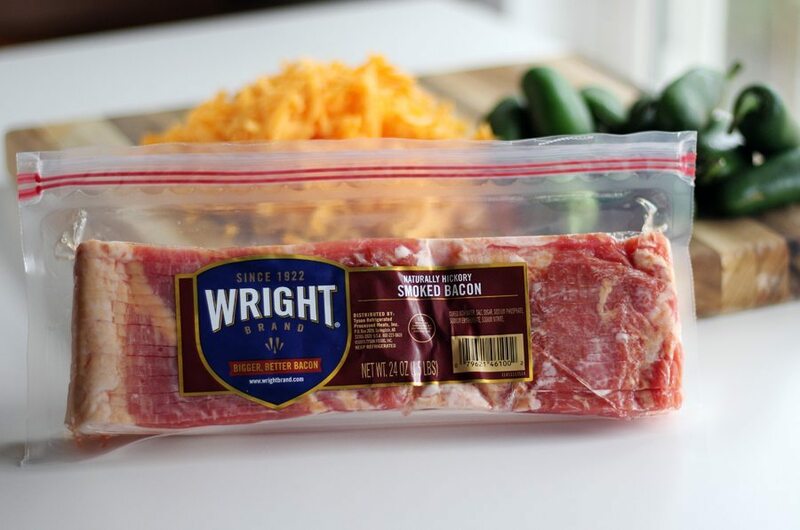 Anytime we get to create a recipe with Wright® Brand Bacon, we know it is going to be amazing. 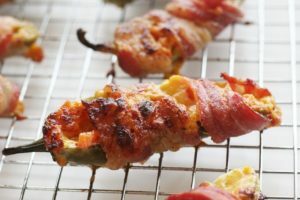 This easy recipe for Pimento Cheese Bacon Jalapeño Poppers is an instant classic for all of your parties, especially on game day. With only 8 ingredients, you are going to love this savory, salty + spicy appetizer. Seriously, can it get any better than homemade pimento cheese loaded on fresh jalapeños then wrapped with bacon? 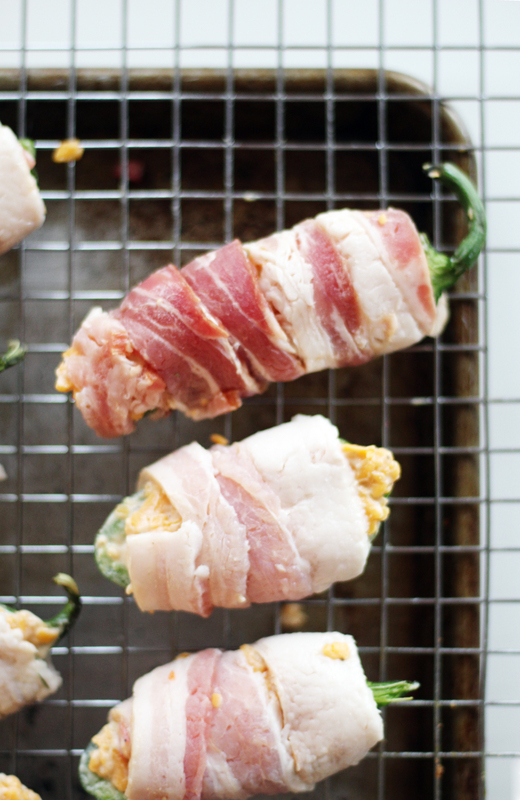 Pimento Cheese Bacon Jalapeño Poppers, ya’ll. In Tennessee, a tailgate party or homegate party does not happen without Wright Brand Bacon. Bigger, better bacon is always a winner at our house, especially when it involves a ton of cheddar cheese and jalapeño peppers. When in doubt of what to make at your next football gathering, just grab some bacon. Trust me, everyone will be happy. You can find Wright Brand Bacon in the refrigerated section at your local Kroger. Grab your favorite pimento cheese or make your own. 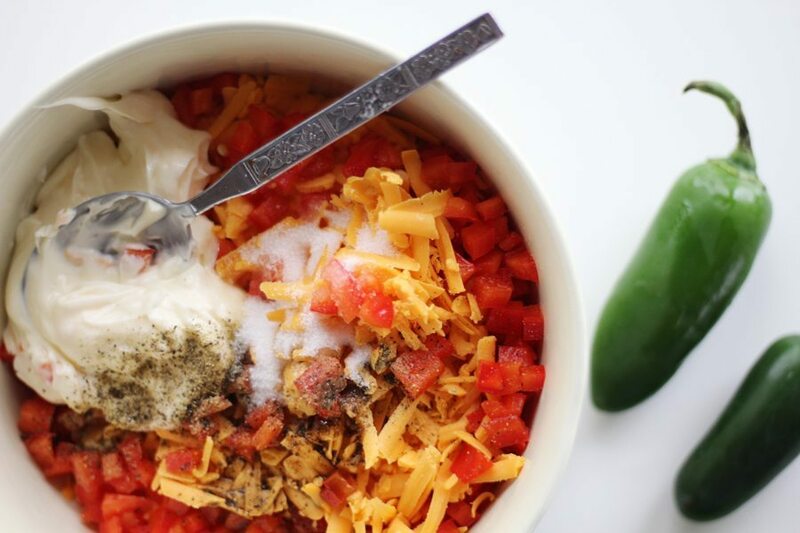 We like to use homemade because we can use cheddar cheese. Most store bought pimento cheese varieties are made with processed American cheese. 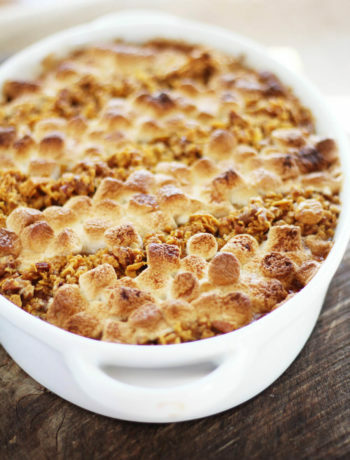 No shame in that, but it doesn’t hold up as a jalapeño pepper stuffing as well as our sweet-meets-sharp version. A lotta cheese, some red bell peppers and a little mayo later and you have the cheese stuffing dreams are made of. 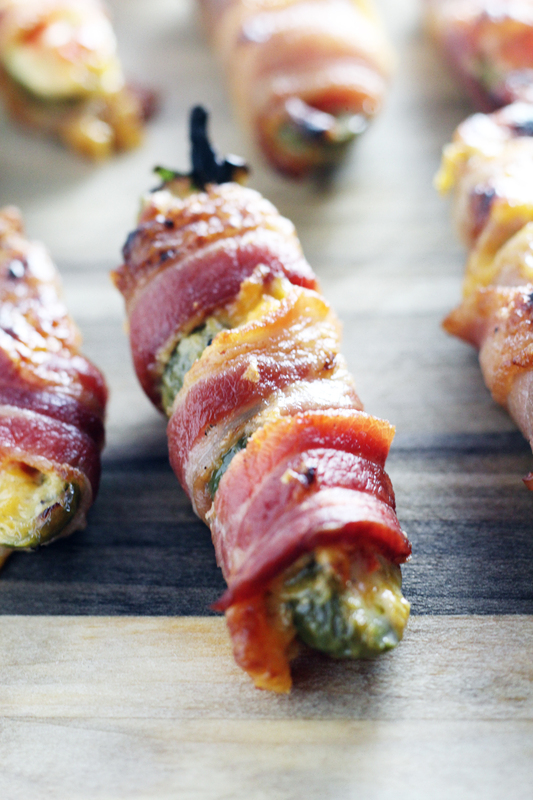 Get everything you need for this Bacon Jalapeño Popper recipe at your local Kroger. To control the level of heat in these Bacon Jalapeño Poppers, scoop out all of the seeds using a spoon. Be sure to get the membrane and white part in the peppers. Slice the Wright Brand Hickory Smoked Bacon in half lengthwise. You can use a whole slice if you want, but we wanted to get a nice crisp finish on our Pimento Cheese Bacon Jalapeño Poppers. So we cut it in half. Pop your Pimento Cheese Bacon Jalapeño Poppers in the oven for about 35 minutes on 375 F. Then turn the oven on broil for 3 to 5 minutes at the end to get a nice crisp. Your cooking time will vary based on your oven and amount of bacon. Feel free to cook them as long as you’d like without burning. As long as you have the jalapeño poppers securely wrapped in bacon and turned open side up, they shouldn’t spill too much cheese. Cool slightly before serving. My kids love them dipped in sour cream to cool the spice. Me? I like my Pimento Cheese Bacon Jalapeño Poppers straight up. Aren’t these gorgeous? 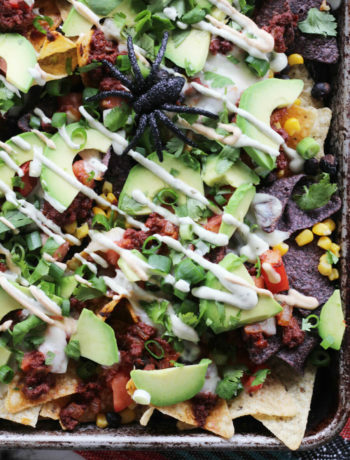 Seriously, game day recipes don’t get better than this. 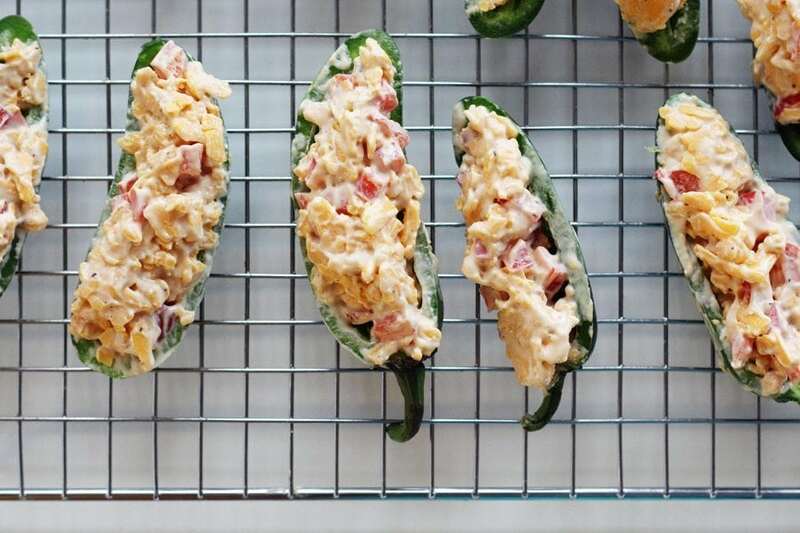 Mouthwatering, cheesy, and delicious, these Pimento Cheese Bacon Jalapeno Poppers will be a crowd favorite at your next party. Cut jalapeños in half lengthwise. Scoop out the membranes and seeds using a spoon. Fill each jalapeño half way with the pimento cheese mixture. Slice the bacon slices in half lengthwise. 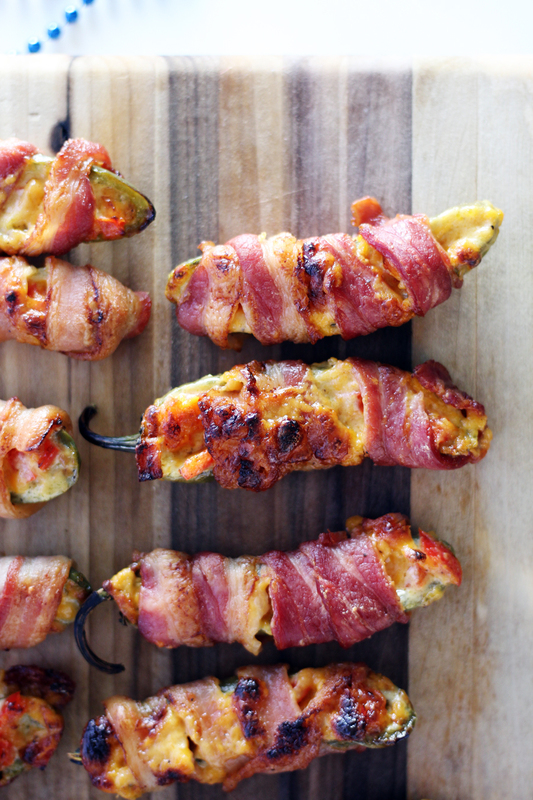 Roll each cheese filled jalapeño pepper with a half slice of bacon. 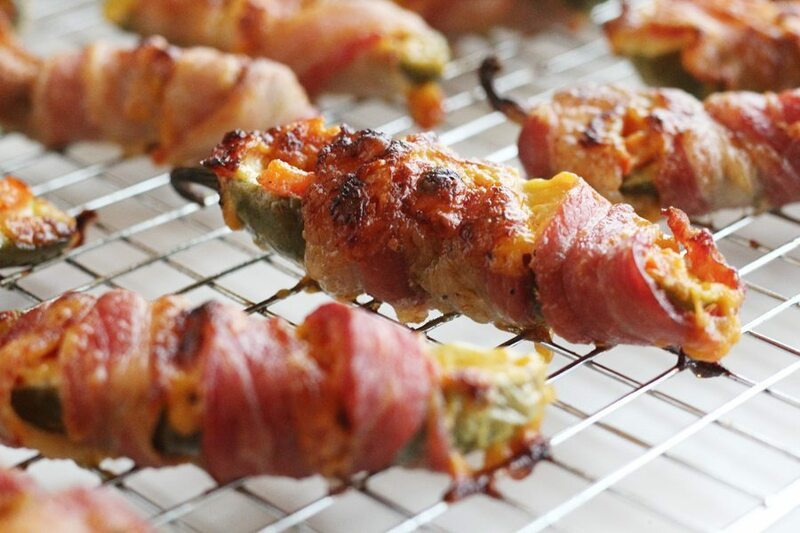 Place the bacon wrapped jalapeño peppers on the wire rack. Bake for 35 minutes at 375 degrees F. Turn the oven on broil, and broil for 3 to 5 minutes until the bacon is browned and the cheese is bubbly. 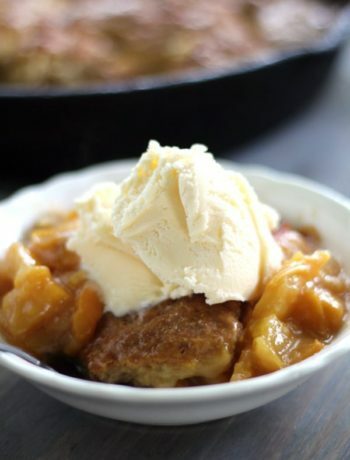 These sound delicious – so many great flavors happening here! I can definitely imagine these disappearing fast at a tailgating event! I agree Football & especially the food you have with it are HIGH on the list. 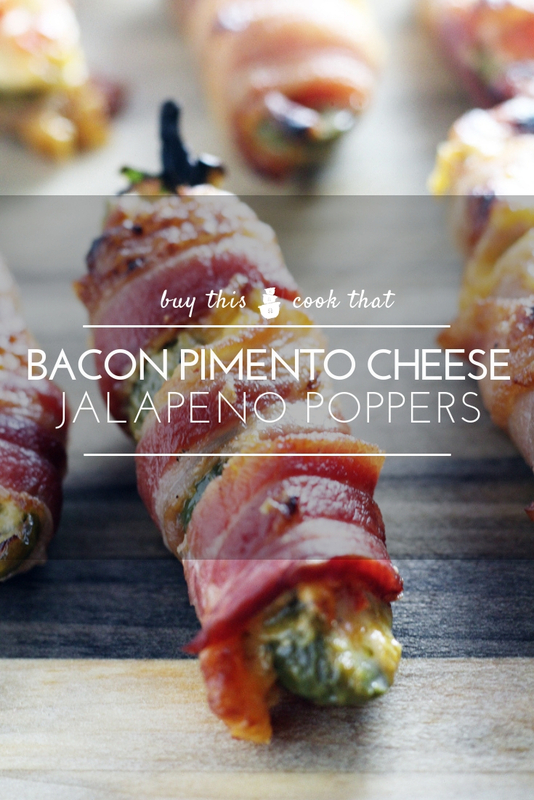 I love jalapeno poppers and your version sounds awesome. Thanks, Stephanie. I’m crazy about jalapenos, too. Great pictures, the poppers look delish!